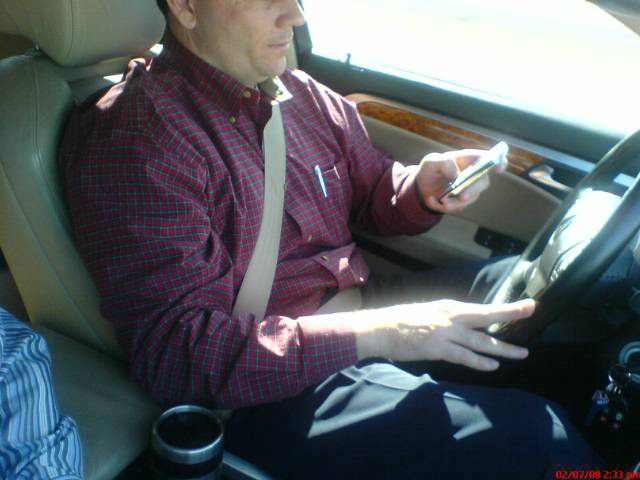 Just say NO to using a Blackberry while driving! Yup, that is Greg eating a donut, drinking coffee, talking on his cellphone and steering with his knees (and passing a Prius). Fortunately for me he has a GREAT deal of skill doing this (no doubt due to years of practice). It is a sad commentary that a Blackberry takes SIGNIFICANTLY more attention than eating, drinking and talking on the phone all at the same time. The guy swerves all over the road now! He did better with knee steering! Wow- is that guy a superhero? He is so smart and good looking, he must be from Buffalo!